Stiller Warehousing and Distribution has invested more than a quarter of a million pounds in a new batch of ultra-safe trucks. The Newton Aycliffe family-run firm has spent £280,000 on the four new vehicles which include a number of state-of-the-art safety features. The 18-tonne, 36-feet long trucks, each costing £70,000, are curtain-sided and built to the latest diesel omissions as standard. The Iveco vehicles are also fitted with the latest body work built and tested to German engineering standards. Fitted to the rear of the trucks are lifting platforms used to deliver pallets to ground level which have been specified to nearly double the normal size and fitted with collapsible safety barriers to help prevent falls from height. The trucks also come equipped with a bespoke reversing camera system. Stiller’s latest investment in equipment, people and facilities – including two new warehouses costing more than £1.8m between them – takes the company’s total spent to almost £7m in the last three years. 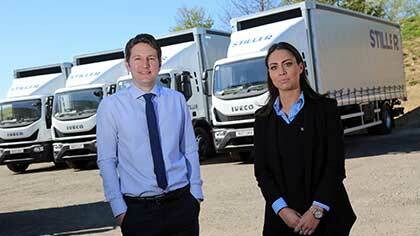 Managing director Matthew Stiller – pictured (above) with commercial co-ordinator Lizzie Brophie and the firm’s new trucks – said: “It’s another sound investment after a period of steady and positive growth for the company, which reflects how well the business is doing. “Two of the new trucks are replacing old ones, while two will be new additions to our fleet, and they’re really state-of-the-art vehicles which will further improve efficiency. Stiller spent more than £1m on a range of new vehicles, including state-of-the-art longer semi trailers (LSTs), three years ago. And in November 2014 the firm spent another £350,000 on a fleet of eight new vehicles, including two 12-tonne vehicles, two urban trailers and four long double-deck trailers, followed by a further investment of £125,000 on five new trailers in December 2015. Stiller has also invested heavily in its 20-acre site, situated at the heart of Aycliffe Business Park in Newton Aycliffe, in recent years. More than £1.1m was spent on a new state-of-the-art, 40,000 sq ft warehouse, increasing the company’s warehousing capacity to 200,000 sq ft, in 2015, and last year it invested another £750,000 in a 40,000 sq ft extension, which was completed earlier this year. And staff numbers at Stiller have steadily grown to 138 along with the firm’s continued investment programme. “We’re committed to expanding our site in Aycliffe while improving our existing facilities and vehicles to make sure we’re performing to the best of our ability,” added Matthew Stiller.